Note: All hotels are normally fully booked by mid January. So if you want to come at Easter book early. 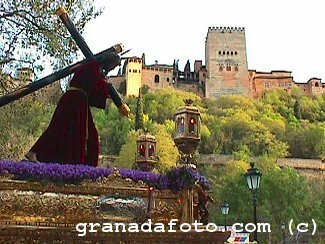 The above links give more information about the routes and times of the Easter processions in Granada. Please note that only some of the processions have been included, and that times are approximate. Each procession will go to the Plaza del Carmen (where the Town Hall is) and the Cathedral, so if you are anywhere in the centre you are sure to run into several processions. The Granadinos take their Holy Week very seriously, and the Granada processions are quite spectacular. If you've never seen a Holy Week procession before, it can be quite breath-taking. Each hermandad (literally "brotherhood") has their own procession and is understandably extremely proud of their figures of Christ and the Virgin Mary. Everyone is involved and a lot of time and effort is spent making the figures as beautiful as possible. 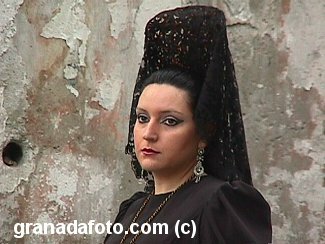 During the processions, the floats ("pasos") with the figures are carried on the shoulders of the "costaleros" (traditionally men and boys), and are followed by processions of "nazarenos" in long, hooded gowns, the penitents (carrying figures of the cross on their shoulders), and women and girls dressed in black traditional Spanish costumes carrying candles and crosses. They are accompanied by brass bands playing soulful marching tunes which mark the step that the carriers must follow. The weight of the paso depends on the size and it can take as many as 40 men to carry. 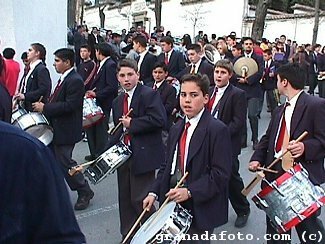 If you come to Granada in the weeks leading up to Semana Santa you might possibly run into one of the practice sessions and might wonder what a group of men are doing trying to carry a wooden structure on their heads with bags of sand, etc. It is hard to choose between the different processions, but perhaps my favourite two are the "Silent Procession" on Thursday (when the street lights along the route are turned off and the procession takes place in absolute silence) and the "Gypsy Procession" on Wednesday (which goes through the Albaicín/Sacromonte quarter). During the Gypsy Procession, bonfires are lit along the route and stops are made every so often for "saetas" (traditional songs to the Virgin) to be sung. 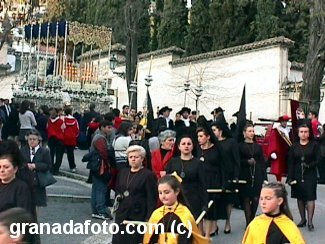 The route is particularly difficult because of the steep climb to the Albaicín up the Cuesta Chpaiz and even harder, at the beginning of the Sacromonte Road which is steeper and only wide enough for the procession itself. There is a frantic rush for people following the procession to get out of the way in time as it rounds the corner and picks up speed up the hill. The procession finishes at about 4 o'clock in the morning in the Sacromonte Abbey.